“Precious and Few” is a pop song your parents might remember. But, it also describes the dining event known as The Mist Project. The dinners are few: a limited run of about a month; ending in Salt Lake on Feb. 19 (although there’s a possibility the run may be extended by a week). And, they are precious: $150 per person, not including wine—actually: $187-and-change if you figure in the 18% mandatory gratuity. Frankly, I was skeptical about Mist. Mist is a so-called “pop-up” or “guerilla” restaurant, meaning that, like the circus, it comes to town for a short stint and then vanishes. It’s a little difficult, however, to separate the Mist hype for the reality. For example, the Website claims that The Mist Project “produces incredible food and an incredible experience as it travels across the globe.” Doing a little fact-checking, however, it turns out there have been only two Mist experiences: one in Park City in 2008 and the currently running Mist:SaltLake. There is also Mist:SanFrancsico TBD in summer 2012. That’s it. So much for globetrotting. Speak to Mist founder/executive chef Gavin Baker and you’ll hear ambitious talk about “finding solutions to the global food crisis by researching and reinterpreting lost indigenous foods.” That sounds impressive; I just don’t see much evidence of it happening, yet. There is talk of convening with tribal elders, and there is a documentary film crew currently following Mist around. I understand they’ve funded a trip to Asia, so perhaps some indigenous dishes will be rescued or reclaimed there. Like I said, it’s worth your while to slice through some of the hype surrounding Mist. What is undeniable, however, is that Mist really is an incredible dining experience. In full disclosure, I should say that I certainly don’t have the budget to attend Mist dinners, but the Mist folks were generous enough to invite me and my wife as guests. My Mist skepticism extended to Chef Baker’s claims of producing “Michelin-caliber” guerrilla cuisine at his temporary, one-off restaurants. That particular doubt, though, was quickly put to rest. If there is a dining experience in Utah worth your hard-won $187, this certainly is it. The Mist dinners are being held in the space that was formerly Metropolitan restaurant, and the setting couldn’t be more appropriate. It’s wonderful to see Metro reborn—however temporarily—and to once again enjoy world-class cuisine in that dazzling locale. Each dinner is 15-16 courses, and begins with a rapid-fire succession of one-bite (or one-slurp) amuse bouche-type courses, such as a single spoon with a small morsel of buffalo carpaccio, a slice of jicama, and a single, tiny, roasted mushroom. There is duck confit served in a shot glass with barley risotto, sweet potato and feta, next to a test tube of foie gras parfait and another shot glass of heavenly duck “tea” which is more akin, really, to duck consommé than tea. Then there’s a course called “Sticks,” where a single, explosive bite of pork belly is served alongside cold barley “gelato”—on wooden sticks. In the middle is a small portion—just enough to tantalize the palate—of candied bacon in a paper cone with almost-microscopic popcorn morsels, sage, white cheddar and powdered bacon fat. It’s all very, very impressive and equally delicious. Now, I am not especially enamored with food that is pretty as a picture but not so pleasing to the palate. Baker agrees, saying that “food is not art.” He believes it can be artful. But gorgeous, alone, doesn’t get the job done. Baker has managed to strike a lovely balance between artful food—every single Mist dish is beautiful and beautifully presented—and flavor. Food doesn’t appear on plates simply because it looks good, but because it tastes terrific. Each and every course is unique, too. Baker travels with a truckload of specially made plates and other serving dishes, many made from rosewood, ceramic tiles, custom glassware and such. As I recollect, there was only a single course served on anything resembling a standard restaurant plate—and even that was white china with a domed lid. After the first four or five courses, things slow down a little. The courses get a little larger and diners begin to relax. 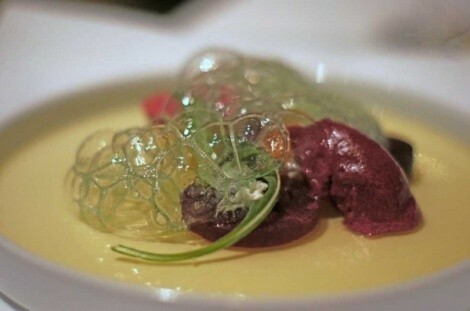 There is a stunning beet dish involving beet meringue, beet sorbet, beet gelée, pickled beet, roasted beet and more, all drizzled in an amazing looking (and tasting) layer of chlorophyll-honey bubbles. The course that follows is equally impressive: ginger-spiked tuna tartare encased in a thin, see-through cylinder-wrap made from shrimp, with avocado puree and a single piece of pomelo soaked in yuzu. On the ceramic tile plate is also a dollop of Lebanese couscous with tapioca, salmon roe and wasabi tobiko. And, we’re only up to course No. 6. The eighth course will change from week to week and be created by a guest chef who appears Mondays at Mist. The lineup is Colton Soelberg, Viet Pham, Ryan Lowder and Takashi Gibo. There’s a perfectly seared diver scallop garnished with minced thyme-shallot-pancetta and topped with mushroom foam. There is melt-in-the-mouth braised short rib served in a cocktail glass with a layer of potato mousse and chorizo gremolata on top. There is an eye-popping dish called “Campfire,” which is a 500 degree granite stone sizzling with coffee- and soy-cured beef medallions, complete with a tin can of barbecue sauce in the middle and even “edible coals”—grey-black nuggets that look like charcoal but are made of candied something-or-other. The ambitious evening concludes with a succession of four delectable dessert courses, including an amazing “Edible Forest.” Four hours has flown by without my even noticing, in part helped along by an impressive service team. I couldn’t eat like this every night, but I really wouldn’t mind trying. In a nutshell, Mist completely won this old skeptic over. Get it while you can.